Based on our earlier Agriculture programme which ran from 2003-9, UPLift is a targeted program designed to assist marginalized communities on the Thai/Burmese border that lack food security, opportunities for income, and education. Through the use of small grants and skills trainings, these families receive the opportunity to pull themselves out of poverty without having to rely on external aid indefinitely. 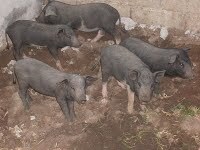 Current projects include vegetable growing and pig-raising. Since 2004, our Izara Arts project has brought work remote producer groups in Thailand and Burma through the design and sale of striking handicraft products combining elements from different cultures in a single product. We sell these products through hotels and stores in Thailand and abroad, and through our website. Khom Loy is a non-profit, non-denominational foundation that has been working with Burmese refugee and ethnic minority communities along the Thai/Burma border since 2003 to improve both self-empowerment and equality. 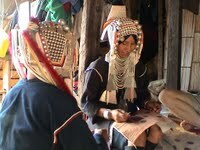 They face Insufficient land, Lack of Thai nationality, High levels of malnutrition, HIV/AIDS, Poverty. Racial discrimination and Loss of their history and traditions. Khom Loy's early childhood intervention trains kindergarten teachers in exciting and interactive programs (based on Montessori methods) which help the children learn Thai, and learn to learn. Since starting the programme in 2004, we have converted 41 school rooms and trained over 80 staff prepare non-Thai speaking children to help assimilation into Thai society. 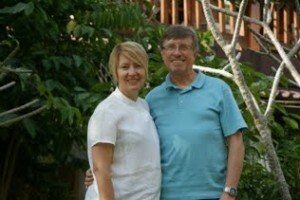 Paul Hancock and Patricia Solar started the Khom Loy project in 2002. Khom Loy Development Foundation is now a foundation registered under Thai law, working on projects assisting the Burmese migrant/refugee communities based on the Burma/Thai borders. We are currently working on projects in the fields of agriculture, income generation, education and handicrafts. You can also donate via the credit card on the internet... click on the Donate Now button. Once at Donate page click on "Khom Loy" Note: there is a 3% transaction fee to cover credit card fees, bank fees, and other processing costs.